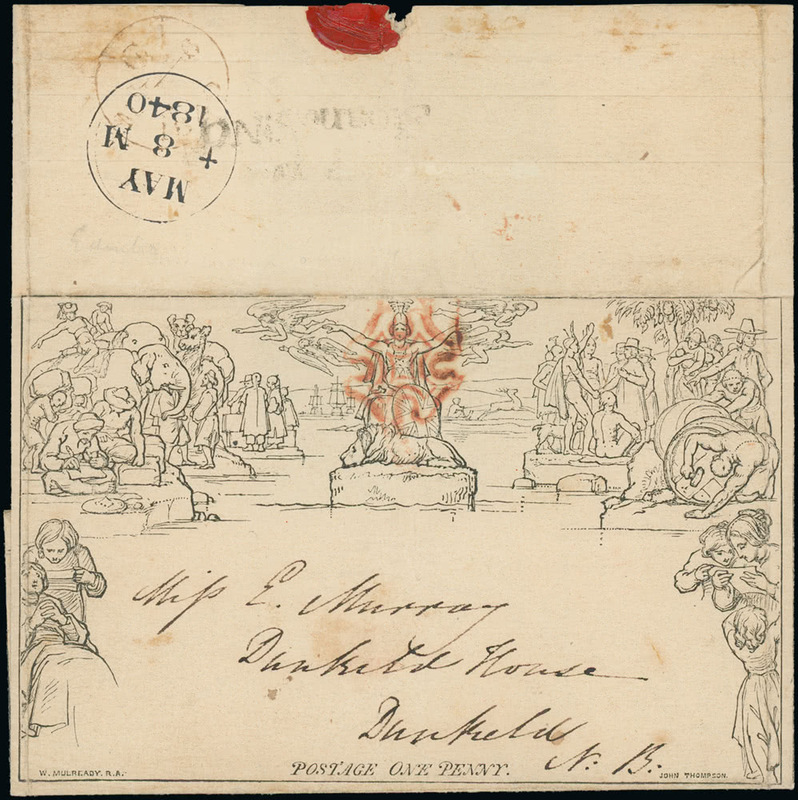 Sent on 6th May 1840, the first day of use, from London to Dunkeld, the Mulready 1d. lettersheet (lot 210) reached £2,947 in spite of some creasing. From the Surface Printed section of the sale, a handsome imperforate colour trial of the 1867-78 10s. in greenish grey (lot 526, left) was sold for £2,210. A strong offering of Seahorses included a superb unmounted mint marginal block of four of the Waterlow £1 dull blue-green (lot 780, above) that rose, unsurprisingly, to £13,508. A very intense shade of the De La Rue 10s. 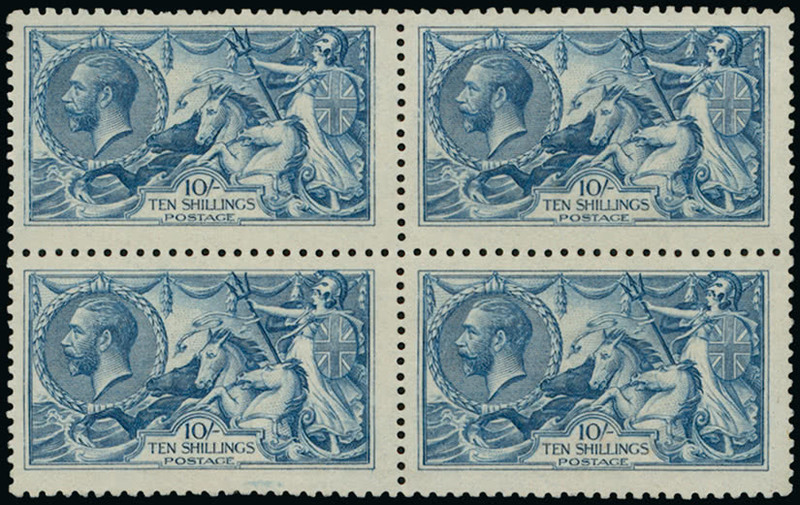 deep blue in a fresh mint block of four (lot 799) climbed to £ 9,824. A most attractive marginal example of the Waterlow 2s.6d. very deep sepia-brown, known as the ‘Vandyke brown’ shade (lot 758), soared to £2,088, whilst a colour standard specimen of the 10s. indigo (lot 762, left), believed to be one of just three in private hands, found a new home for £3,193. 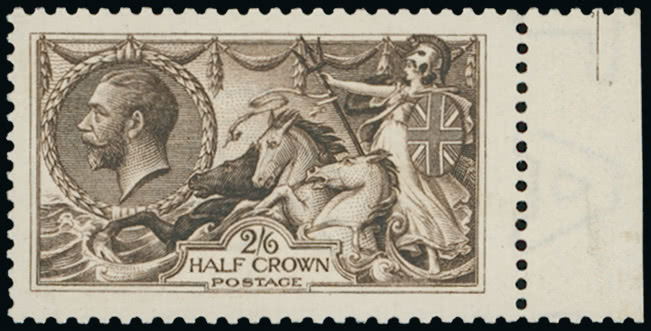 Unmounted mint examples of the popular 1929 P.U.C. 21/2d. watermark inverted variety (lot 860) and the 1935 Silver Jubilee 21/2d. Prussian blue shade (lot 892, left) sold for £2,947 and £12,280 respectively. A fine mint copy of the scarce 1912-24 Royal Cypher 10d. 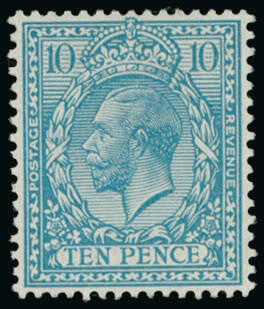 turquoise-blue with watermark inverted (lot 746) reached £1,842. The 1948 Olympic Games set of imperforate imprimaturs (lot 914, above) achieved £7,140. 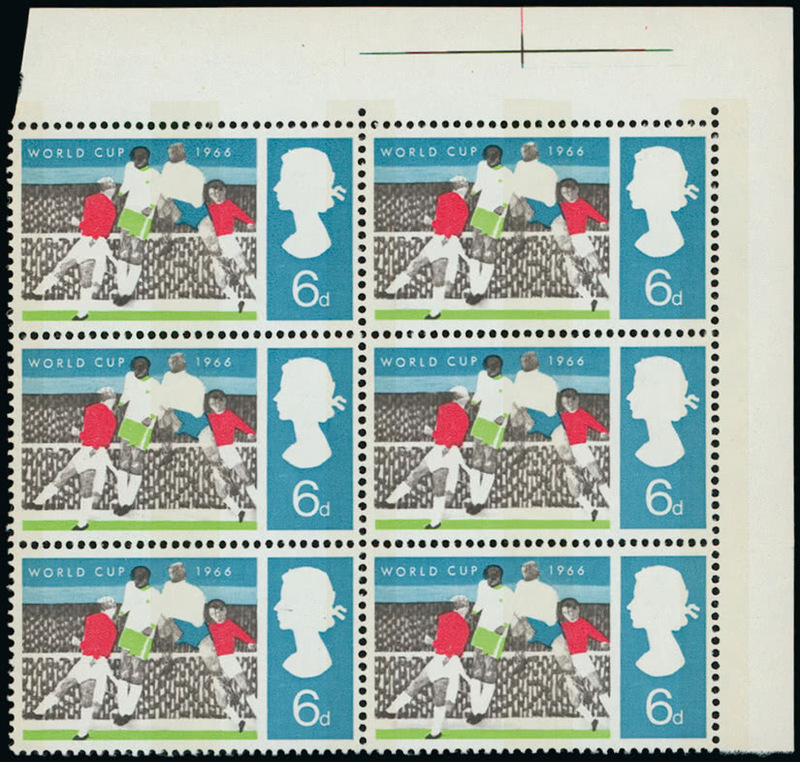 Amongst a series of high prices paid for modern commemorative varieties, a corner block of six of the 1966 World Cup 6d. 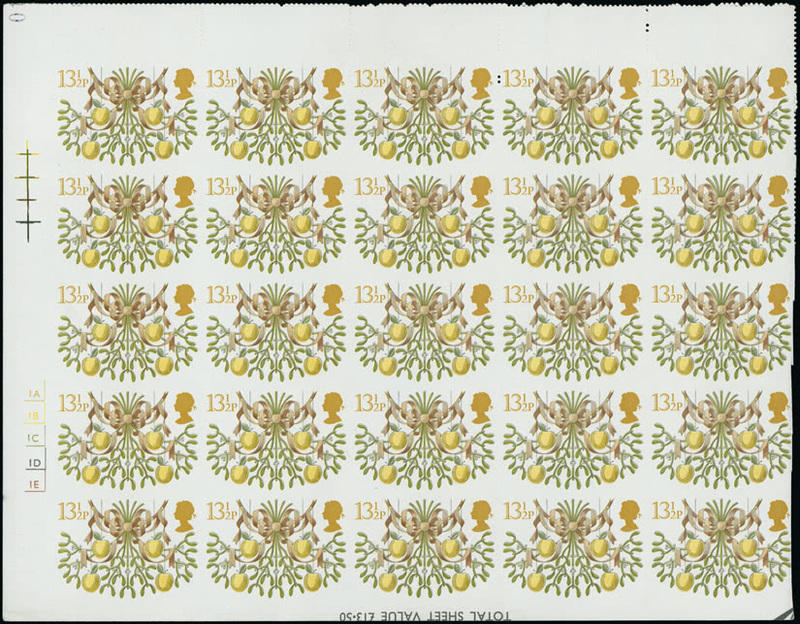 (phosphor) with black omitted (lot 999) reached £14,122, whilst the 1980 Christmas 131/2p. in a quarter sheet of 25 with the lower two rows completely imperforate (lot 1031), a previously unrecorded variety, sold for £11,424. This auction confirmed once again that demand for rare items continues to grow. 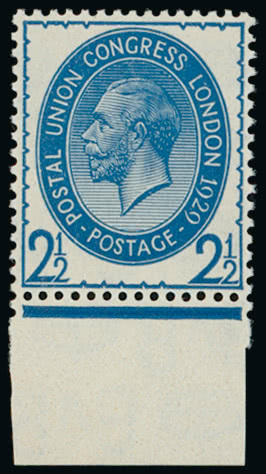 The Great Britain market can, however, be very harsh toward items where condition is not top grade. Quality counts. Full listings of prices realised at each auction may be downloaded from the Grosvenor website www.grosvenorauctions.com. The next specialised Great Britain auction at Grosvenor is scheduled for 18th November and consignments will be accepted until the end of September. Please contact Andrew Williams at Grosvenor for further information.